Those who know Larry and his Flask can expect to witness a wild and crazy stage party when they see the band live. Playing adrenaline fueled bluegrass folk music with a gypsy punk ethos, the group is known for members that refuse to stay put; even their drummer refuses to play seated. This is a band that takes full advantage of its unplugged components: double bass player Jeshua Marshall performs with particular intensity, lifting his massive instrument to drag it from stage left to right, all the while wailing on it with open palms, summoning the odd bow, or even technical sweeps to sate his seemingly furious need to move. 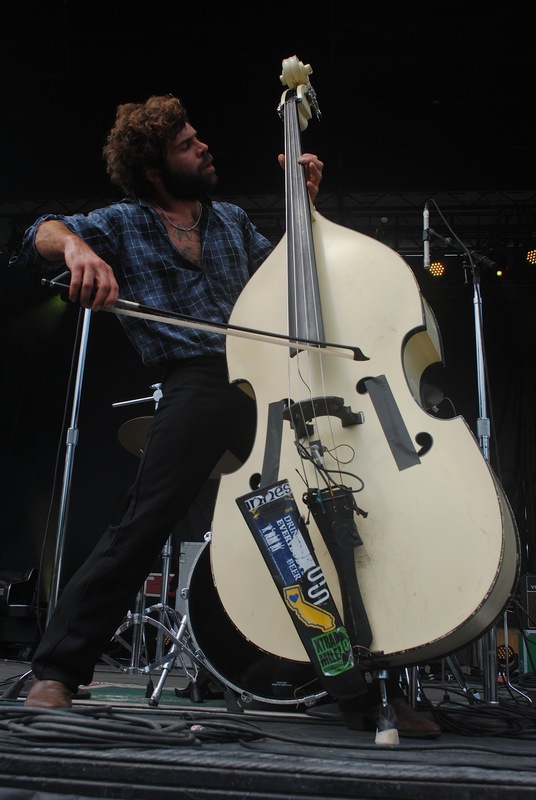 Larry and His Flask opened TURF’s July 6 festivities at 11:30 a.m., pushing its “workday ahead 12 hours,” as lead guitar and vocalist Ian Cook put it. But when it played day three of TURF, by the end of its set, the group had arrived at a level of exhaustion entirely different from what they would at any old early show – they played an 11 p.m. set just the night before. The band will also close out the festival at Lee’s Palace with Frank Turner & the Sleeping Souls and Northcote. This entry was posted in Burden of Salt and tagged Larry and His Flask, Toronto, Toronto Urban Roots Fest, TURF on July 8, 2013 by Tom Beedham.